A feature-heavy, twin-footswitch box that doesn't quite deliver on sound, but is big on ideas. Superb value for money. Impressive classic delay emulations. Feature-packed. Adds hiss to your signal. Although best known for cheap and cheerful mini pedals loaded with familiar circuits, Mooer has been quietly beavering away on a series of larger, feature-heavy units. 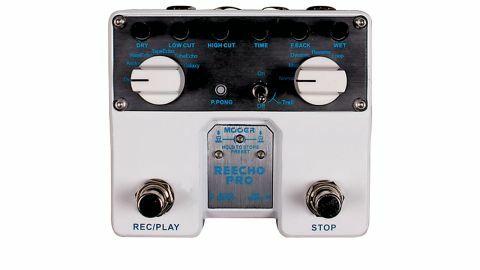 These twin-footswitch stereo stompboxes have been showcased at numerous trade shows, but among the first to hit the UK is the Reecho Pro delay, which boasts a number of features that belies its reasonable price point. "There's no adjustment on the modulation, but its wash of chorus is well voiced, while the tape sounds compete capably with more expensive units"
The Reecho Pro is Mooer's answer to the likes of the Boss DD-20, offering six delay types (digital, analogue, echo, tape echo, tube echo and galaxy) and three effects (mod, dynamic and reverse), which can be assigned to any of the delay types. You also get a separate ping-pong button for use in stereo, low and high cut filters, plus a built-in looper. You can save a preset by holding both switches together. The pedal operates from a nine-volt power supply only, includes stereo inputs and outputs, and offers a choice of true or buffered bypass using the trails switch. Not only does the Reecho Pro offer impressive emulations of classic delay effects, but also incredible versatility; the ability to apply effects to any delay type, as well as filter the repeats, gives you a lot to toy with. There's no adjustment on the modulation, but its wash of chorus is well voiced, while the tape sounds compete capably with more expensive units. Galaxy, meanwhile, adds a volume swell to repeats, removing your pick attack for a string-type sound. However, the Reecho adds a slight hiss to your signal - a shame given the tonal integrity of the repeats. With the Reecho Pro, Mooer has presented a well-spec'd pedal packing some genuinely good ideas at an impressive price point. And while a couple of niggles prevent it from being an essential addition to your 'board, this Pro proves that there's more to Mooer than mini pedals.